Blood Offerings is the newest studio recording from Bay Area death cult NECROT. Released via Tankcrimes on June 9th, the record earned the #29 spot on Billboard’s Hard Rock Chart and #52 on Billboard’s New Artist Chart upon its first week of release! The eight ravaging tracks comprising NECROT’s Blood Offerings were captured by Greg Wilkinson at Earhammer (Vastum, Graves At Sea), mastered by Brad Boatright at Audiosiege (Nails, Gatecreeper), and comes shrouded in the unhallowed cover art of Marald Van Haasteren (Bolt Thrower, Baroness). Blood Offerings is out now on CD, LP, and digitally on Tankcrimes and on cassette through Sentient Ruin Laboratories. The limited vinyl edition comes as a foil-stamped, gatefold deluxe LP available in four color variants: 150 in purple splatter, 350 in gold splatter, 500 in black, and 1000 in gold. Stream the record in full THIS LOCATION where you can also purchase the record digitally. Find physical preorders at THIS LOCATION. 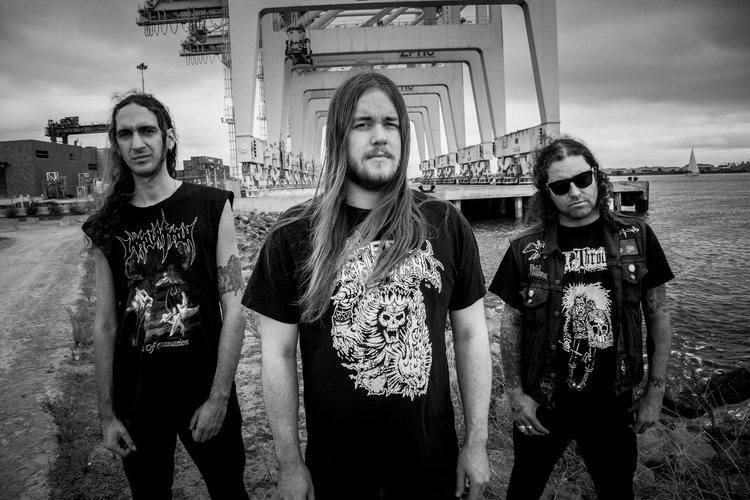 NECROT will embark on the month-long North American tour with Denmark-based death metal tyrants, Undergang, beginning June 30th and rolling through July 29th. The band will also make their way to Europe this fall for a journey that will include stops at Bloodshed and Graveland Fests. Further details to be unveiled in the coming weeks. Forged in 2011, NECROT — founded by current and former members of Acephalix, Vastum, Saviours, Watch Them Die, Atrament, Rude, and more — unleashed the audio bone-crush of their The Labyrinth full-length in 2016 via Tankcrimes. Spewing forth eight tracks amassed from three hard-to-find and long out-of-print demo tapes, the record reaped critical acclaim from fans and media alike compelled by the band’s unrepentant Autopsy, Bolt Thrower, and Sacrilege worship.